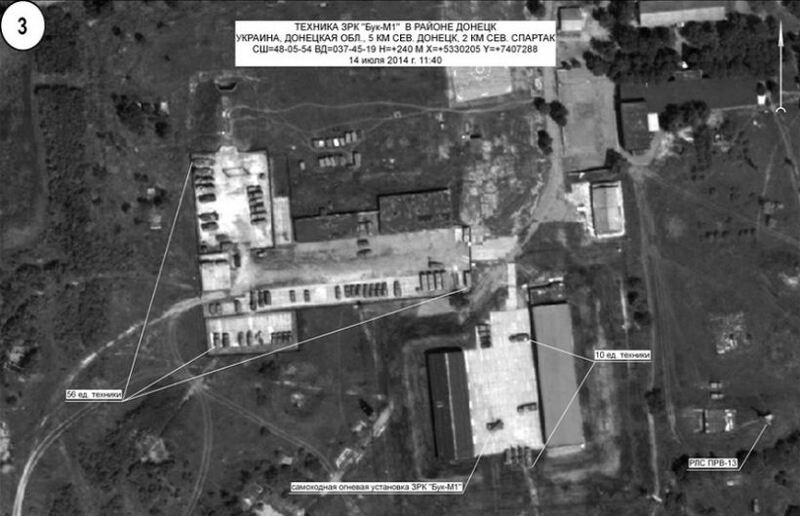 In Bellingcat’s 31 May 2015 report, Forensic Analysis of Satellite Images Released by the Russian Ministry of Defense, the Bellingcat investigation highlighted a number of discrepancies between the satellite images presented by the Russian Ministry of Defense and Google Earth satellite imagery from 2 July 2014 and 21 July 2014. 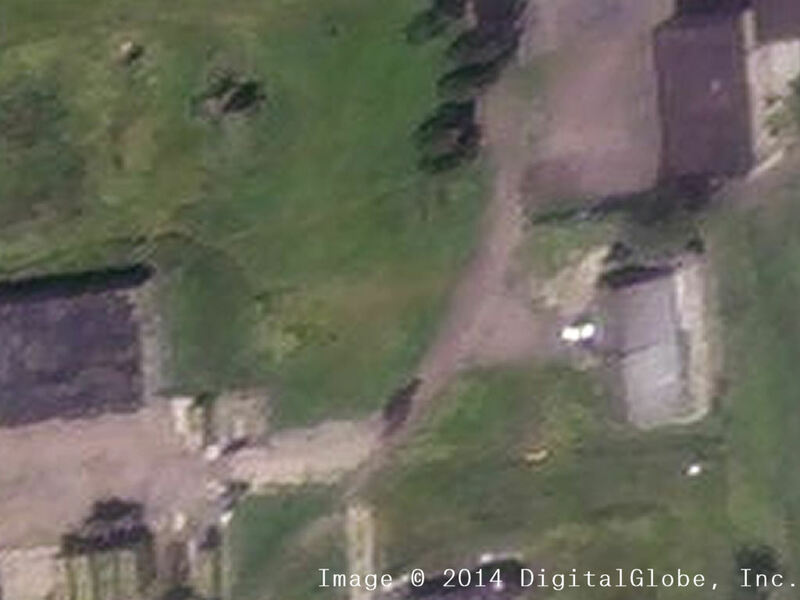 Thanks to donations by Bellingcat readers it has now been possible to purchase satellite imagery from Digital Globe dated 17 July 2014 and collected at 11:08 a.m. local time of one of the sites shown in the Russian Ministry of Defense imagery. 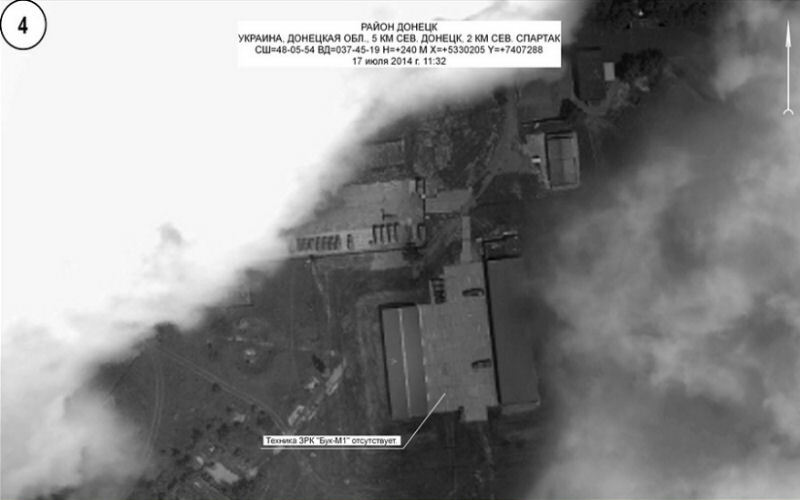 This is the first known purchase of 17 July 2014 satellite map imagery from this location, and comparison between the Digital Globe imagery and imagery Russian Ministry of Defense imagery shows there are clear discrepancies between the imagery. 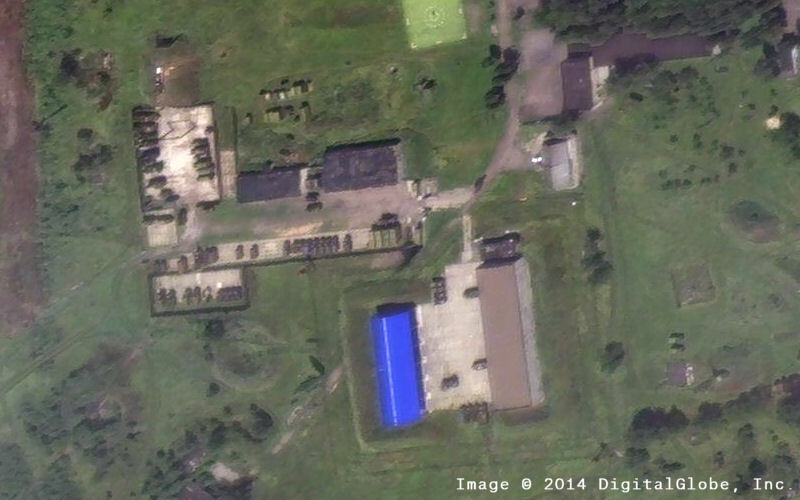 In addition to those discrepancies there are also clear similarities between the Russian Ministry of Defense imagery and the Google Earth historical satellite imagery from May and June 2014, which are not present in the July Google Earth and Digital Globe imagery. 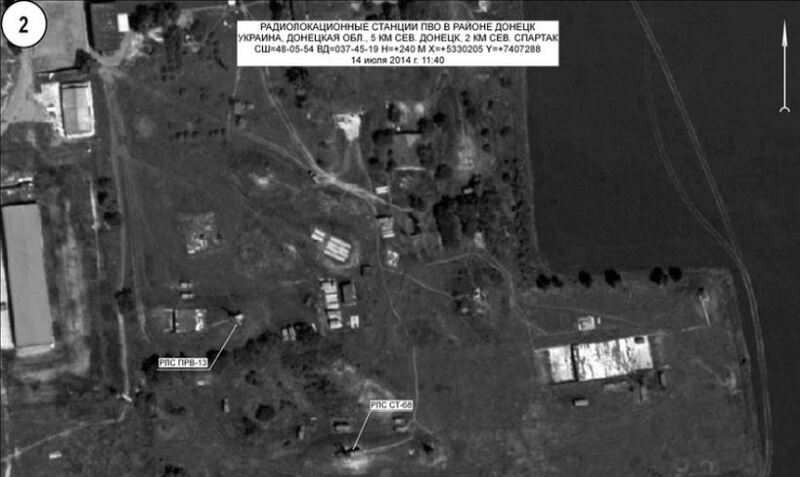 This clearly demonstrates that the imagery presented by the Russian Ministry of Defense is from before July 2014, confirming they produced false satellite imagery at their 21 July 2014 press conference on the downing of Flight MH17. The full report can be read here, and is also available in Russian and German. 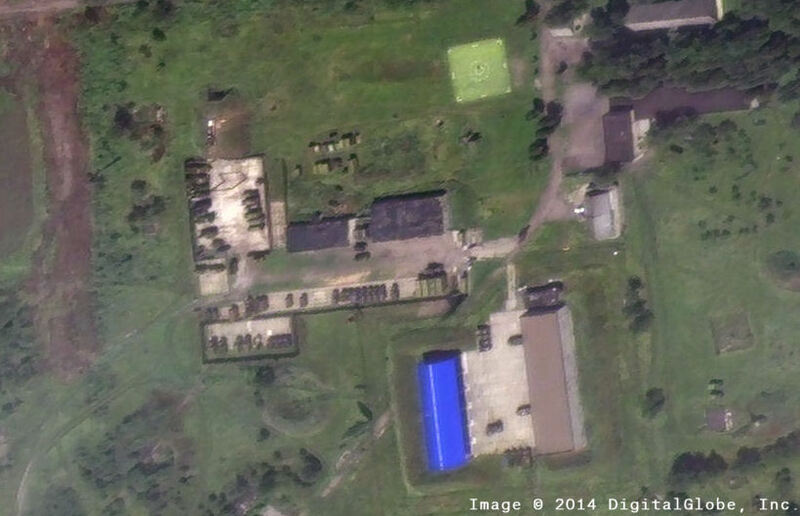 Below are interactive comparisons between the Russian Ministry of Defense imagery and the Digital Globe 17 July 2014 imagery. There is a claim that a private investigator now has conclusive evidence of what happened. There is also a claim that there is a video showing the shootdown. Let’s see if more information will come out. Well, that’s a lot of guessing around here. Where to start? >>> Look at your first image! The shadow in the PM image is almost rectangular to the street. Now look at your last image! You see a clear shadow line right at the SW corner of the white building right above your SunCalc pin. It’s obviously a different angle than your SunCalc shadow, right? >>> Wrong. In mid june the sun is as close as possible to the Tropic of Cancer. Flightradar24 is a commercial service to present airplane positions on the internet. They never intended to be a forensic platform for airtraffic accidents. Obviously they recieve data and calculate an estimated next position just in case the data flow from any transponder of thousands of airplanes would have a drop out or even stopps running. “Andrew, I think we are getting off of the articles main intention and the reason the Russian MoD presented this information. >>> Let’s try it again with a little bit of logic please! There is one BUK. That BUK travelled completely unseen from anywhere to Donezk. No photo, no twitter, no YouTube, no VK… NOTHING! First, there is a huge discrepancy between the observations of the same thing in both directions obviously. Second, there is a very very strange preknowledge of observer “WowihaY” knowing it will come, knowing where it will go, knowing what’s under the tarp. Third, you can observe very early tries of high Kiev officials to connect that BUK on a trailer to a small separatist 3 tank convoy (let’s call it Vostok convoy) following about 30 minutes later on the same N21. They never mention that Toyota! Btw, that’s what Bellingcat do as well but there is not one single evidence that Vostok and BUK ever met that day. You can use suncalc to prove the opposite. Hence, even Bellingcat can prove the opposite by public sources. Now, when did the MoD released the satellit images? About 5 days later? Anyone around here should imagine the international situation during these 5 days. The entire West including NATO was forced to DO SOMETHING against the (a little bit to obviously) guilty russians. Can anyone smell it? Next, to prevent an uncontrollable situation – a war of a much bigger magnitude – the russians HAD TO spread some doubts on these piles of pretty strange “evidence”. It wasn’t the question to put conclusive and well investigated counter evidence on the table. They HAD TO do ANYTHING. May be it helps to understand that before you go on discussing the hour of the satellite image in detail. The hour is completely irrelevant in every respect. Let’s call it entertainment for the masses. 1) Why is noone searching for that Toyota RAV4? 2) Why are there so many evidence in one direction and not one single evidence in the other direction? 3) Why is Kiev strongly interested to connect that BUK to the Vostok convoy? 4) How could SBU-contact-WowihaY in Torez report that BUK in Torez 30 min too early knowing where it was heading and how many missiles it is carrying? 6) Why should any russian or separatist not use the dircet road to russia but reappears for a final video shooting (showing the missing missile) on the wrong road in the wrong direction on the wrong side of the frontline? 7) Why doctered the SBU alleged telephone conversations? …including an alleged conversation that says “the BUK has to go with Vostok” what it never did? …refusal to follow an order or fake? 8) Why is the SBU that eager to misinterprete the “Strelkov” message including the timestamp they posted as a screenshot? 9) Who is the source of the video stills we were presented as Paris Match photos taken in Snizhne? Of course I suspect these images to be video stills because of the extreme blocking artefacts of a JPEG compression. Btw, that blocking can tell you something about the original size of the image. 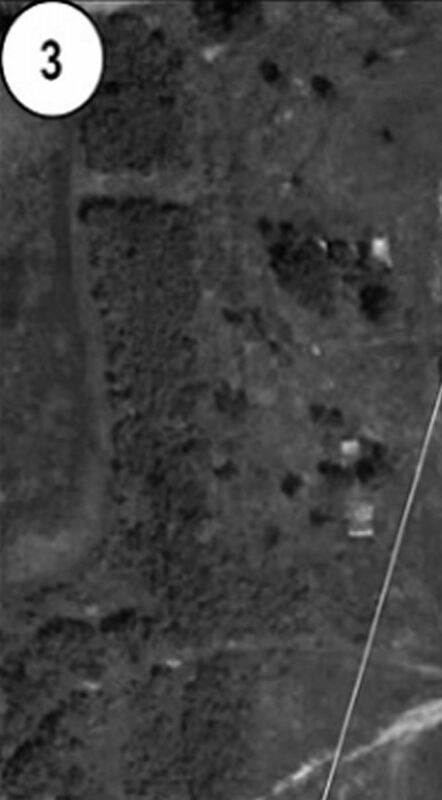 10) Even Bellingcat confirmed the vignetting in the zoomed photograf of the rocket trail. Well, I can see it in both upper corners. Where is the vignetting in the lower corners because vignetting is the result of a circular hole? The J.I.T. is searching for the names of those involved in the transportation of the BUK. They made a little video to ask for the help of any witness. Why did they BEEEPed the names they are looking for in the video while not BEEEPing the f-word? Do anyone believe they recorded the telephone conversation with BEEEPs over the names or do they know at least parts of the names already? The exact hour of a proven falsified date is really really really completely irrelavant. Start asking the right questions because Donbass is not that far away. But first, I want to counter you argument against me. You state basically, the Russian MoD had to put out something to prevent a large global war. I am glad you point out ‘They HAD TO do ANYTHING.’ to counter the evidence that was being shown against them. WHICH INCLUDES LYING TO THE WORLD AND TO RUSSIA’S CITIZENS. This is your belief on the presumption of preventing global war by NATO being waged on Russia. First off, MH17 is a global incident and tragedy of a large scale, and I hope their families find some sort of satisfaction and peace eventually. My condolences go out to them. BUT an act of war, that NATO has to respond to? No way. Western military powers are slow in their response time and try to get all the facts. They prefer to avoid war, but are prepared for it. It took 3 years of Saddam denying the UN inspectors among other atrocities for a coalition to be formed and a war between that coalition and the 5 largest military in the world to start. It was a global incident, but even when KAL007 was intentionally shot down, and others, there was not a knee jerk reaction to go to war. What the West and NATO did was gather as much evidence of what they could as fast as they could, determine if it was an INTENTIONAL act of war, and if they could not make that determination, then leave it to the courts to do the FULL investigation. It was clearly not an act of war, like bringing down a Polish President’s plane. NATO would not get DIRECTLY involved because Ukraine is not one of its proxies, but it could make a statement and show it is ready, if Russia were to continue to blow aircraft out of the sky. It could have been a reason for a coalition of forces to get involved in Ukraine, but not NATO specifically. It did not happen, because the defense forces of the West made the conclusion it was not an act of war, but what it was they were not sure. The Russian MoD did not have to point fingers, they could have just disputed the presented evidence of the Ukrainians and others. Instead, they brought up SU25 story which is impossible and faked satellite images to point a finger at Ukraine, not to deny evidence pointed out by Western sources. And not to avoid a global war because they knew the West would not do that unless they intentional targeted AirForceOne or some other significant World Leader. I doubt WW5 would have began if Russians targeted Donald Trump’s plane. They had five days to prepare for their presentation, and most all of the presentation has been shown to be a lie, fraudulent, or manufactured. They have not retracted any statement they made on that day. Know who makes up lies and tries to place blame on everyone else? pressed the red button because they allowed commercial airliners to fly over a zone of military activity where other airliners had gotten shot down before. My gut feeling is – They knew they were guilty and they knew the truth would come out eventually to everyone, and they wanted to prolong the investigation until after they had a chance for Donbas’ militias to create the ‘land bridge’ to Crimea. They knew, as any criminal does, possession is 9/10s the law. It is difficult to take something away once people possess it. They knew the would be paying heavy fines for MH17, and felt in for a penny, in for a pound. Get the land bridge, get industrialized Donbas, get Crimea, and maybe then let things settle back down. That is their goals inside RedSquare. A trillion dollar lawsuit by MH17 passengers crew and Malaysian Airlines? Stretched out over 30 years, they could live with it if they have their Kryme Dachas and a way to drive their from Moscow. Add to that the bonus military equipment and technicians and intelligence that was in Donbas. That is my gut feeling of why they lied and continue to do so. Not some global fear of NATO invading Russia due to 300 innocents dying. That and a fear of the amount of evidence against them AND evidence that was collected so quickly in little Ukraine which they felt the world had little concern about, MH17 just brought Russia’s and its proxies hybrid war in Ukraine to the global stage. That is why they lied and why they hold to the lie. Other reasons may have contributed, but those are the two main ones. They LIED and did not care about being caught in the lies and fairy tales. Now achim to your quiz. 1 – Rav4 was in the driving lane and not parked along side the road like the trailer was. It could have been involved, but most likely was just some civilian vehicle like the one that took the photo. 2- Ukraine’s intelligence was on the ball and watching areas and the separatists to get an upper hand. The fact that they collect stuff in Donbas is because not everyone living in Donbas supports the terrorists. 3 – Mentioning a coincidence and the amount of of military vehicles on the road was just showing Russian vehicles in the Donbas, which they were trying to prove to get some kind of international help in Russia’s hybrid war being waged on them. They were trying to follow a model of international law and get Russia”s actions condemned. They presented evidence and said – here UN, look at this and make of it what you will. 4 – BUKs drive around with less then 4 missiles on them? To the other, maybe he heard a group in a bar or club discussing the destination and route. Separatists and Russians have not exactly been shy about what they are doing, it is all over social media, so do you think they would be shy in a disco? Do you think he may have been able to buy the info of the route for a drink? 5 – There may be some errors in analysis done by the SBU with intelligence. After all, in the photos to show the USA Congress, they just grabbed all photos on the desk and brought them with them due to time constraints and did not sift through them all. Not everyone living in Donbas is SBU intelligence or Donbas’ terrorists. There are some that just live there hate the terrorists. And yes, they can make mistakes too. 6 – They knew they shot down a civilian airliner and were trying to take a round about course, then Russian bosses told them to get across the Russian border as fast as possible so the guilty BUK and crew did not get captured in Ukraine. Maybe the intention was to get to a trailer first, and then the bosses said just drive the BUK back to Russia. To much time to load it? then changed mind? 7 – Didn’t hear they were doctored. Just heard the reason Vostok and the BUK did not meet was because Girkin changed mind about deployment. 8 – Girkin’s message is there for the world to interpret. It is pretty plain actually. Remember also, this is the intelligence they released, it is not all they have. 9 – Artifacts can also be cause by crack in windshield, glare from sun, reflections, and like you say, a lower quality camera. maybe a 3 MP? You say video and video stills, but I do not believe it. I think it just photograph. As to who? Does it matter? I am sure investigators might have it, but the public does not need to know. Some still live with the terrorists in that area and if the name gets out the person or their family could be in danger. We all know the tactics the terrorist’s militias use. 10 – Possible explanation of this is due to sun shading. Sun is up above. It could be due to part of the irregularity of the hole that they are shooting through. Not all holes are perfect circles, brink and pieces of mortar might get in camera view. Bonus – Protection of peoples identity from the terrorists is important to them and to the person’s with information families. They can interpret and know about the phone call without the names in them. The relevant people know what was said and have an idea of what they can be helpful with. There are a lot of questions, and some of them need to be asked in the right context and some we may never have answers to as far as specific motives or reasons because the guilty have lost their tongues and are not talking or corruption of evidence. HOWEVER the fact that the defense department of the second largest nuclear power in the world that we live on faked them is not. And on top of that, they faked them and offered them to the world for the world’s scrutiny. Be one thing for behind closed doors intelligence and defense and diplomatic talks, but they broadcast it to the world. It is one thing to be called a liar behind closed doors, but to present falsified evidence to the world and be called a liar by everyone??? WHY? You are not helping, you are obscuring. You clearly haven’t understood any of the questions Achim is asking. So why answer them in snoozing pro-Kiev mode without any clue whatsoever? 1. Achim is referring to the car that accompanied the BUK at the Zuhres vid. 2. Is about the lack of evidence concerning the very long alleged roadtrip of the BUK before it arrived in Donetsk in the morning of 17 july. Same is true for entire route after it allegedly fired its missile – except for the (highly dubious) SBU vid. 3. Ukrainan officials and outlets tried to plant the BUK in a convoy in which it never drove. The BUK was not accompanied with tanks and trucks carrying separatist fighters of the “Vostok battalion”, as can be seen from Zuhres vid. Only 2 cars drove behind it. 4.Wowihay claimed the BUK was standing in /Torez at least half an hour before it could ever have arrived overthere. 1 – It was a quiz and I was making a logical guess. It could have been the RAV4 was connected to the convoy, but really it does not matter since the Trailer was one stolen by Donbas militias and utilized to carry various Russian armor to the battlefield. They lead the convoy and no one denies it, but it could have been anyone driving and whose to say they were actually at the missile launch site at the time of the launch, they could have been leading other lost Russian convoys around Ukraine after they set up the BUK. 2- There is more evidence in the court of public opinion right now then ever. And most of it points to the guy in Red Square and his cronies. There is very little other then circumstantial evidence placing the guilt squarely on Ukraine’s current government. 3-They did not try to plant it in a convoy, they were demonstrating that this particular trailer that was stolen by Donbas militias was used for various operations hauling Russian equipment around the battlefields of Ukraine after coming from Russia. IE Russian involvement. 4- Maybe it was another BUK. If I remember right, there were at least three that had been seen in Eastern Ukraine in areas under Separatists control prior to that day. Whose to say all of them got captured on video. And yes, some are far out of the flight path, I think 2 that were spotted were further North and could not be considered culprits in this mess. I have read various spin doctors and conspiracy theorists on reasons why Girkin would make this claim but it not be actual facts. To me they do not hold water. I think its very bold to claim that the facts concerning the alleged Strekkov posting have been spinned by conspiracy theorists but the spin in which a message fallaciously has been contributed to set up a conspiracy is something which holds your water. Also your other “maybe this, maybe that” only reflect the mindset of a true believer. For every inconsistency in the fficial Bellingcat record you will try to come up with a self-styled ad-hoc theory to mend it. Hector, remember this is a guy who set up execution orders for civilians living in Donbas that squealed to Ukrainian authorities what the terrorists were doing, along with a bunch of other reasons for his gang to commit executions on the spot and not be held responsible. This guy said, if your caught and our gang murders you, it is their right to do it and they will not be held accountable. Little does he know, human rights groups have documented and researched many of these, and many people will face the Hague and other courts for their actions against civilians of Donbas. Who knows what other crimes were committed by these wackos with guns and out on safari from Russia to get themselves a Ukrainian trophy. That is the mentality of those militias, organized criminals, Russian mercs, Russian soldiers in that area. Keep this in mind as you attempt to defend him and the terrorists, who are mostly neonazis from Russia, Moscow organized crime units, and Russian SOF. Just like Crimea, there were about 100 guys who were actual Ukrainians who were the actual militias, the rest of the 40k on Crimea were Russians brought in from Russia. This is the same in Donbas, a majority of the fighting people are Russian citizens. Out of 40k people in the militias, about 6k are actually Ukrainians, that is it. And they also have more military equipment then Romania, France, and Switzerland combined. Oh, yes, this is all military equipment they bought at garage sales and acquired when they took over Ukrainian military bases. Why is it they have 4 times as much equipment then ALL of Ukraine had in 2012? There are facts, and then conclusions that can be made from those facts. Then there are likely conclusions that can be made. Then there are unlikely but possible conclusions that can be made from facts. Then there are ones that if all the conditions were just right they could happen. Your conclusions are a blend of the final two. Not impossible but when they are put under a microscope, they can be discounted as just next to impossible. If 3 missiles in Lugansk is evidence of shooting down MH17, what is 3 missiles in Kramatorsk on an indisbutably Ukrainian Armed Forces BUK evidence of? Sorry, they are not clear enough to state for 100 percent those are not carrying four missiles. The BUK ahead of 312 in the photo on the left looks like only three missiles, but all four are there. They one that is a screenshot from a video or a photo from a phone at night just cannot see the one on the far side with the red or white nose cone. Even in the video with them off the trailer, you can see they are fully loaded or empty. The various videos show either fully loaded or empty, nothing that says conclusively that any of the Ukrainian BUK systems only had three missiles. Just that they had some deployed in Ukraine in the case of a full scale invasion by Russian forces which Uncle Vova had stated publicly he might do, I can take Kyiv in a week. Behind closed doors, imagine what he stated to diplomats and the Ukrainian government before he made that public statement. Various all different BUK footage for you to decide for yourself. Earliest is March 19 2014, if I read right. To me, all I see is shadows around the last nosecone and never can confirm or deny that there is only three on that BUK, just that I cannot see the fourth one. Just because I cannot see the fourth one does not mean it is not there in the video footage. All others I have seen have been either empty or fully loaded of BUK being deployed or moved around by Ukrainian military. If one or more of them were fully empty as seen in Last video which one of your photos came from, I can only imagine they are support or on the way to some position they can be loaded, but I have yet to see any that I can say for sure there are only three, other then in the famous video of the BUK 3 * 2 that drove back to Russia. They really didn’t need to strain much at that seeing as Ukraine self-admittedly had many more BUK’s deployed into the field of battle than did the seperatist rebels. Ukraine is of necessity a suspect by way of possession of the weapon in the theater of the crash until it can clearly demonstrate that none of its forces fired a BUK missile, and none of its BUK’s were deployed in a location that could reach MH17. Nearly a year has gone by and they have not taken even the most modest steps of candidly providing to an outraged world now outdated military deployment information to definitively clear their own name, or of providing an inventory control log demonstrating no BUK missiles were fired or otherwise lost. Those simple steps – providing an accurate order of battle of Ukraine’s BUK launcher units on July 17, and providing military inventory control records of BUK missiles from July 16 and any later date after July 17 as well as allowing the conducting of an independent inventory audit by an impartial observer like the OSCE would directly end all discussion on where the guilt of the shootdown lies. It should have occurred in a press conference in Kiev within days after the Russian Ministry of Defense presentation on July 21. Ockham’s Razor suggest that because Ukraine has not acted to clear their own name even though it should be straightforward, simple, and uncompromising for them to do so, they cannot actually do so. This is why I believe they are either the guilty party in the shootdown. Remember that instead of disclosing information after July 17 and seeking to assist recovery and investigation, Ukraine launched a military operation towards the crash site that compromised the international recovery efforts and endangered local and international emergency responders. Andrew, Ukraine doesn’t need to prove to the public they did not do it, they need to prove it to the courts. The right to remain silent until your court date is something ALL suspects in the west can do, and even in court cases they can remain silent. It does not mean your guilty, it just means something irrelevant like you cheating on your wife does not get out in the press during a court investigation of you robbing a bank. It is relevant to the investigators, however, if your found not guilty your dirty laundry, or in Ukraine’s case military troop and equipment placement does not get revealed to those who are trying to kill those troops. They were in evidence retrieval mode at the time, and they had only so many hands on deck. Not to forget that the Ukrainian military was heavily infiltrated by GRU and FSB agents. They could disseminate all the information and evidence they had in the PUBLIC COURT OF OPINION, but they do not have to. You still did not address the simple fact Russian MoD provided falsified claims and I would say fabricated evidence for the court of public opinion. If the Ukrainian military had proven themselves innocent with the info you request, the Kremlin spin doctors would have demanded more or attempted to work in the circles of Ukraine still not being cleared of guilt. Endless circle of discussions like we are having now. Ukraine’s government felt it best to hold their cards close to their chest and be cooperative with the courts, but not the Kremlin spin doctors. I admit to myself, that Ukraine is still a suspect right now. I would say however of all the information and evidence in the social media is against the Kremlin and the various criminal gangs that have flooded Ukraine from Russia. And much of that is provided by Russian bloggers and Russians who document all they do. The plane was shot down in an area that Ukraine’s government did not fully control. Negotiations were held, and separatists would not guarantee the safety of the investigators from their own militias and they refused to a temporary giving up of territory to the Ukrainians. The Ukrainians said fine, we need to secure the area, and if your not willing to help, we will concentrate on that area to secure safety for various international groups inside their country. Cooler heads outside of Ukraine ended up stopping the Ukrainians and separatists from fighting, as you say to protect the evidence on the ground. I.E., the West said if you do not guarantee the safety of international investigators, we will come and secure the area ourselves. The Kremlin did not like that, and spoke to the separatists. And evidence collection got started. So why did the Russian MoD present falsified data and narrative? Ukraine does not need to prove anything, neither does Russia. Its the prosecution who has to prove guilt. Your right, that is how democratic and Western and International courts work. BUT when you have a totalitarian or dictatorship or FASCIST REGIME LIKE IN, I won’t say it but the first two letters are ru, running the government you have to prove your not guilty or you wait over two years while the government collects their ‘proof’ for a crime that has only a 3 month jail time or your just brought up for political reasons or because some crime boss has an ax to grind and he bribes the judge and prosecutor to hold you without evidence so he can steal your business that was undercutting his business. Anyways, your right, and that is what I try to tell these mamalukes that say the USA has not released its satellite data or Ukraine needs to release to the public its manifestos of amounts of BUK missiles. C’est La Vie, and I agree Mr. Hermann, Bud’mo! A couple older articles that have images related to this article and the one about Ukraine having a BUK. Discusses the 2 different bases nearby, BUKs at both bases and a variety of other issues. A bit of satellite imagery and a bit of social media images. Interesting reading if you have not seen it before. At the last comparison a mistake is being made. When you say “look at the field” I can see the images have another contrastlevel or brightness and so the image of the MoD looks “smeared”, but when you are looking very carefully you can see the same patterns on both images. The horizontal linings from the structured pattern are displayed like very, very thin contrasted lines in the Russian image, but are visible. And the reverse is true for the random track though the field: you can see it running too through the structered pattern which is displayed so clearly in the DG image. It’s shocking to me how Russia still has enough imprudence after all the evidence of her guilt and all her refuted lies to throw bots here. I mean, after Australian “60 minutes” story about MH17 downing by Russian forces http://www.9jumpin.com.au/show/60minutes/stories/2015/may/mh17/ what can Russia say? I would enact a simple check for every person expressing an opinion about MH17. Check is simple question “Does Russia wage war against Ukraine?” and if the answer of person is “no”, there can’t be any discussions with such a person about any Russia-related subjects. Another good question would be is RT a factual media outlet or any of the other Kremlin sponsored media sources. If they answer yes, then you have your answer to whether that person is open to debate. I agree with your many points, however, there are many different perspectives and a constructive debate can enable us to attempt to agree and sometimes change our viewpoint or the way we look at a situation. Now you cannot change the facts, but you can attempt to understand another POV or possible scenario of events. I will not claim every skeptic is a Russian Bot or TROLLop, however there are a lot of them. You need a devil’s advocate to be able to disqualify or strength your own arguments. Anyways, debate is good, but when you have a person that does not face up to the facts from that debate because they idolize Putin or hate DC, that is bad. Tip of the hat to you Eliot and your band of digital detectives. I would not be so understanding and indulgent of some of your “interlocutors” here. I suspect many of them are working out of the “Internet Research Institute” offices in St Petersburg, Russia or, as I like to think of it, Lower-Mordor-Rossiya. You attracted the attention of many powerful and evil antagonists of LMR. Please take due care of yourselves. God bless you all. Elliot – criticising the material the Russians have released is a bit disingenuous when the UK government are sitting on the black boxes and the Ukrainian government are sitting on the ATC recordings. I look forward to your investigation as to why these haven’t been released – these two pieces of evidence would give you the culprit. If the evidence shows Russia are responsible, why haven’t they been released? Likely because their part of a highly sensitive criminal investigation. I think the trouble is that all the evidence is being used to apportion blame on Russia, rather than taking all the evidence on face value, and using it to build a picture of events. The events of that day are all that matter! who was it that shot down MH17, not who had buks or planes or whatever. The Russians say it was the Ukraine forces, and the US, Ukraine, and the entire western media say it was Russia. Russia and America know what happened, they know. What evidence has the US/Ukraine put forward to back up it’s claims! and if they haven’t, why not? Buks give off signals when they are beaming, tracking/targeting, these signals would have been picked up by any awac’s aircraft, or other listening stations in the area. If it was a missile, the area the missile was fired from would be known, with pin point accuracy. The only story that seems to fit the bill, and would explain the lack of forthcoming evidence, is that it was indeed a Ukrainian jet that downed MH17, because this is the only claim that can never be conclusively proved! Really? You say lack of evidence? There has been a lot for compared to other airplane incidents over the years. And all the claims in your post just shows how little you know about investigations and court cases. No one HAS to put out evidence for the public to guess at before the court case. If no one said anything, which is almost a reality since JIT has not released what evidence it has collected, then it would make for a fairer trial in the courts. That is why in most Western nations, when your arrested your advised you have the RIGHT TO REMAIN SILENT. But many people waive that right and start talking because they cannot hold their mouths shut. Your statement – this is the only claim that can never be conclusively proved! – baffles logic! Why would investigators want something that cannot be proven? The SU25 allegation is a FAILURE. It has been proven impossible! And if you really claim the SU25, your a lost cause because that has been disproved OVER and over again. It is impossible for 1 SU25 to have brought down MH17, it is still impossible for 3 to have done it attacking at the same time. The SU25 is not a stealth fighter and it would have shown up on MH17’s radar in the plane and the pilots would have been asking a lot of questions on the radio. 3 of them with their puny 3KG missiles and non auto targeting machine gun fire would have had to take three passes to do that damage. 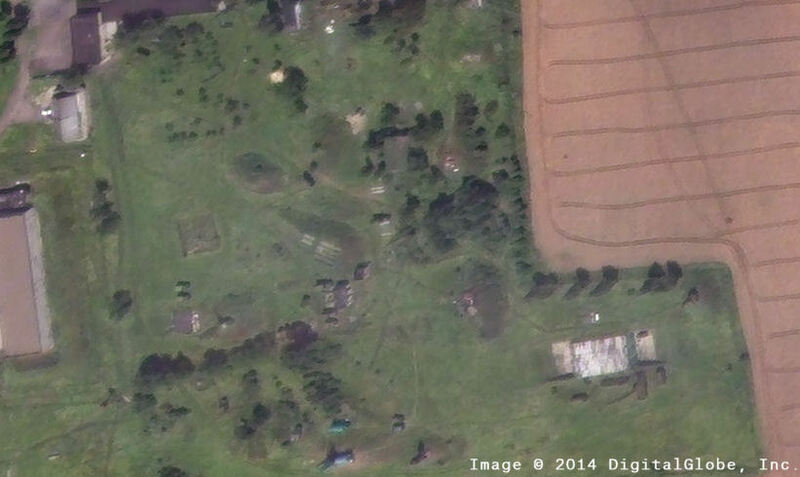 Do you know what was on MH17’s radar before the destruction? Closest airplane was another passenger plane about 50 km away. The pilots did not have time for questions, it was a ONE missile hit that destroyed the plane and ended the lives of almost 300 people in a flash. You, stephan porter, need to do more research instead of commenting on social blogs I think. And stop reading Saker, GlobalResearch, ConsortiumNews, and anything sponsored by the Kremlin. The SU25 claim by Russia is a FAILURE, and if you continue to claim it, it just makes you look foolish and of low intelligence. 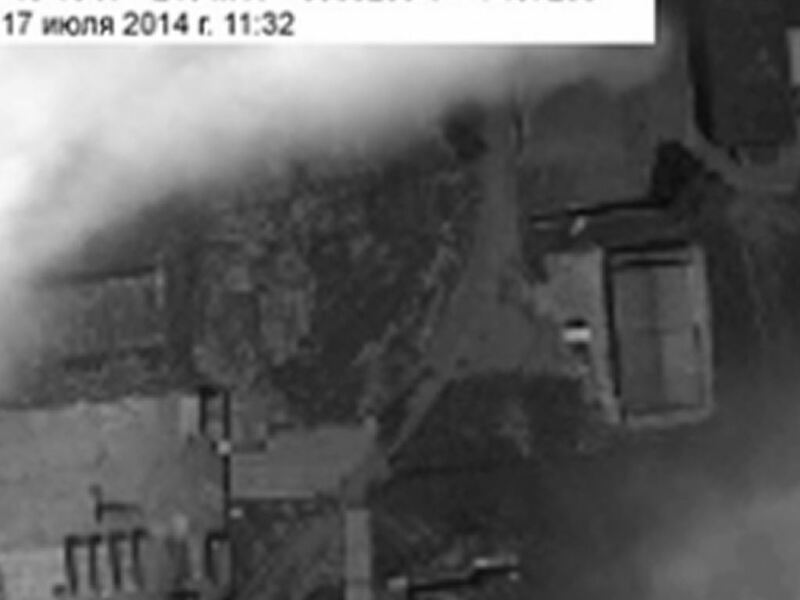 Just like their falsified satellite images, a failure when it is shown under a LITTLE scrutiny. They were proven false in the first week after they were put out. 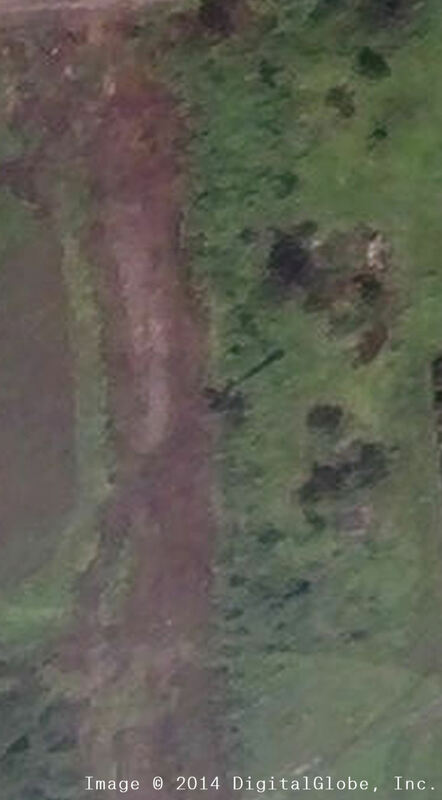 eliot recently purchased satellite photo of the location of where the rebel owned buk would have been around 11.00 am to finally prove the rebels did indeed have a buk unit ….will he post the photo or even a screen grab ? ?